CarGurus has 5,778 nationwide XTS listings starting at $8,495. Now in its second year of production, the Cadillac XTS luxury sedan harkens back to an earlier Cadillac era, when the brand was known for its large, luxurious automobiles with big back seats and roomy trunks large enough to hold a refrigerator. The sporty CTS and CTS-V have become the vehicles most buyers associate with Cadillac these days, but the XTS returns the marque to its luxury sedan roots, when performance took a back seat to comfort, style and plenty of interior space. For 2014, Cadillac offers the XTS in Base, Luxury, Premium and Platinum trim levels. A 3.6-liter 305-hp V6 serves as the base powerplant for all trims, but for 2014 Cadillac introduces a new 410-hp twin-turbo V6, which owners can add as an option at the Platinum level. In addition, a new Intellibeam automatic headlight control system now comes standard on Luxury, Premium and Platinum trims, and the XTS receives a number of new optional features for 2014, including an available Automatic Parking Assist, a rear-seat entertainment system with twin DVD screens, memory settings for the front passenger seat and an available opaque sunroof sunshade. All-wheel drive remains an option for all trims except the Base for 2014. The XTS slots into the automaker's lineup above the CTS, and projects a more classic, refined exterior design. The sharp creases and aggressive lines of the CTS have been toned down on the XTS, which displays a more fluid look. The sidelines taper toward the rear of the vehicle, providing a sense of movement, and the trim around windows thins and widens, resembling elegant brushstrokes. From the side, the XTS looks long and low, in part because the designers stretched out the cabin, moving it forward on the body to ensure good aesthetics and plenty of room inside. The long cabin profile also allows for two additional small windows behind the second-row windows, creating an open feeling when sitting inside. A large overhang in the rear adds to the XTS's appearance and provides plenty of trunk space. Up front, the XTS's bold grille features a multi-dimensional design, with thick chrome slats, a gloss black insert and the distinctive Cadillac wreath and crest firmly planted in the center. On the Platinum trim, the grille gets a satin-chrome finish, and trims equipped with the new twin-turbo V6 get a unique twin-turbo grille. Vertical HID headlights include the automaker's Twilight Sentinel automatic on/off feature, as well as the new Intellibeam feature on all trims except the Base. In addition, the Premium and Platinum receive Adaptive Forward Lighting, which swivels the headlights as the car turns. All trims except the Base get illuminated door handles, which turn on when the driver unlocks the doors using the key fob. Rainsense automatic windshield wipers also come standard on all except the Base, while all XTS trims get heated side mirrors with integrated turn signals, puddle lights and auto-dimming. 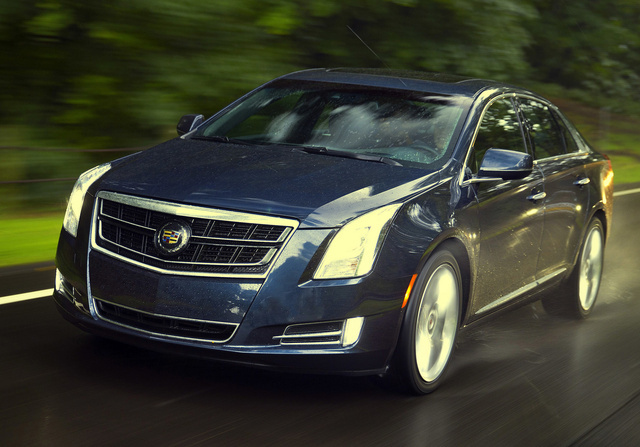 Under the hood, a 3.6-liter V6 provides base power for the XTS. It develops 305 hp, up 1 from the previous year, and 264 lb-ft of torque at 5,200 rpm. The V6 mates to a 6-speed automatic transmission with a manual-shift mode, and drives the XTS from 0-60 in 7.3 seconds. The XTS rides on a front-wheel-drive (FWD) platform in its standard configuration, although owners can add AWD as an option. Fuel economy numbers check in at 17 mpg city/28 highway for FWD trims and 17/26 for AWD trims. Testers say the automatic transmission provides smooth shifts, and the original V6 delivers decent power for the XTS, resulting in a capable luxury vehicle. However, reviewers also say the drivetrain doesn't provide sporty performance, due in part to the XTS's curb weight of just over 4,000 pounds for FWD trims (AWD adds an additional 200 pounds). The new twin-turbo V6, introduced for 2014, should bridge that power gap, since it represents the most powerful engine available in its class, according to the automaker. The twin turbos boost hp for the same 3.6-liter V6 to 410, while torque jumps to 369 lb-ft over a broader range from 1,900 to 5,600 rpm. The upgraded engine mates to the same 6-speed automatic. Cadillac has not yet released 0-60 times or fuel economy numbers for the twin-turbo V6, but it should provide a noticeable improvement in acceleration, with an associated drop in fuel economy numbers. While the base V6 operates on regular fuel, the twin-turbo V6 requires premium fuel. The XTS doesn't quite match the CTS when it comes to sporty handling, but drivers and their passengers should find the ride comfortable and competent, with enough firmness to provide agility without any true harshness. The suspension includes Cadillac's Magnetic Ride Control, which features unique shocks and uses magneto-rheological technology, as opposed to mechanical valves, to adjust damping at all 4 wheels in milliseconds. Sensors monitor road conditions and make adjustments to damping as necessary to provide stability and smooth out road surfaces. FWD trims get new electric variable-assist power steering for 2014, while AWD trims continue with a hydraulic system. The update to the steering in FWD trims might be in response to some complaints about a lack of feedback from the previous year's system. AWD trims include an electronic limited-slip differential, which actively splits torque between the rear wheels to ensure optimal stability and control. All trims ride on 19-inch polished aluminum wheels except the high-end Platinum, which receives 20-inch aluminum wheels with a polished finish and chrome inserts. One of the XTS's biggest assets remains its spacious, well-equipped cabin, which combines the technology found in modern Cadillacs, as well as their high level of fit and finish, with the roominess and high-end luxury that helped define the automaker's vehicles during its glory days. The fluid lines of the exterior are echoed inside, with clean, elegant styling throughout the cabin. The designers have opted for a minimalist look above the top lines of the dash and doors, and a layered multi-dimensional look below. The instrument cluster merges with the fluid dash design and never intrudes on visibility out the front. Passengers will find plenty of legroom and headroom in both the front and rear seats. Front bucket seats come standard in all trims, with 8-way power adjustment for the driver and passenger. All trims except the Base get heated and ventilated front seats, as well as heated outboard rear seats. Soleil Keisel leather upholstery with mini-perforated inserts come standard on all trims except the Platinum, which gets Opus full-leather seats with mini-perforated inserts. All trims include a leather-wrapped steering wheel with wood accents and a power-adjustable column, and in all trims except the Base the steering wheel is heated. The seats are supportive and comfortable enough for longer trips, and the power-adjustable steering column makes it easy for the driver to find the ideal seating position. Other standard features across the line include remote keyless entry, push-button start, an auto-dimming rear-view mirror, illuminated entry and a 60/40-split rear seatback, while all trims except the Base also receive LED interior accent lighting. Dual-zone climate control comes standard on the Base and Luxury trims, while the upper-level trims get tri-zone climate control. Cargo space in the trunk checks in at a generous 18 cubic feet, which exceeds the cargo space in such competitive vehicles as the Audi A6 and A8, the Mercedes-Benz E-Class and the BMW 5 and 7 Series. The XTS remains the first Cadillac equipped with the automaker's new CUE connectivity system, which comes standard on all trims. Resembling an on-board iPad, the CUE system includes an 8-inch horizontal color screen with swipe and haptic feedback features. Located near the top of the center stack, it provides access to the audio, climate, OnStar, phone and navigation systems, as well as to music streaming and mobile apps. Some of its kinks are still being worked out, as a number of owners and reviewers say the system can be complicated to operate, but expect to see it show up in future Cadillacs. Navigation comes standard in Premium and Platinum trims, and it's available on Luxury trims. An 8-speaker Bose audio system with HD radio, SiriusXM satellite radio, Bluetooth, USB ports and a CD player comes standard in Base and Luxury trims, while the two upper trims receive a 14-speaker Bose system. The Premium trims add a color head-up display and an upgraded center console, among the other features mentioned, while the top-level Platinum trim also includes a leather-wrapped console, adaptive cruise control, an UltraView power sunroof and rear sunshades. Options for the Premium and Platinum trims include the new rear-entertainment DVD system. Eight airbags come standard in the XTS, including knee and side-impact airbags. StabiliTrak electronic stability control, traction control and 4-wheel antilock brakes with intelligent brake assist and front Brembo brakes are also included on all trims. The standard OnStar system offers such safety services as automatic crash response, stolen vehicle assistance and roadside assistance. All trims except the Base receive a rear-view camera, which integrates with the CUE system. In addition, the Premium and Platinum trims come equipped with such safety features as forward collision alert, lane departure warning, a rear cross-traffic alert system and a side blind-zone alert system. What's your take on the 2014 Cadillac XTS? tjumpgirl I own a 2014 Cadillac XTS Luxury edition and absolutely LOVE this car. The Magnetic Ride Control make this car a dream to drive. Night time driving has never been so fun or relaxing with the interior illuminating lights. This is truly the best car i have even owned. Loving my decision. joe97478 Looks like a nice car. The interior seems to be of high quality. However my only concern is the relatively poor performance compared to the same V-6 in Chevrolet and Buick models. 0-60 in 6.8 seconds or less seems to be the norm for the Buick Lacrosse and Chevy Impalas equipped with the 3.6 V-6 304 horsepower versions. In the Cadillac it's said to be over 7 seconds, trailing both of the GM cars and also the Chrysler 300 that does it in 6.7 - 6.8 seconds. Not a huge problem, but considering that Cadillac also has a 321 horsepower version of that engine that they put in both the CTS and ATS, it seems that it should have also been installed in the XTS to put it on a level playing field with the Lacrosse, Impala and Chrysler. Even the 3.7 Lincoln V-6 does it in the mid 6 second range. In a 45 to 55k car, it deserves to have an engine that can give it performance equal to or better than it's rivals. Pete I have an XTS-V which does 0-60 in under 5 seconds...faster than a Porsche Cayman. The only drawback is the 20" wheels which make the ride slightly firmer. pek08 I have a 2014 Cadillac xts that I love but the glove box want open and I can't pull it open. Users ranked 2014 Cadillac XTS against other cars which they drove/owned. Each ranking was based on 9 categories. Here is the summary of top rankings. 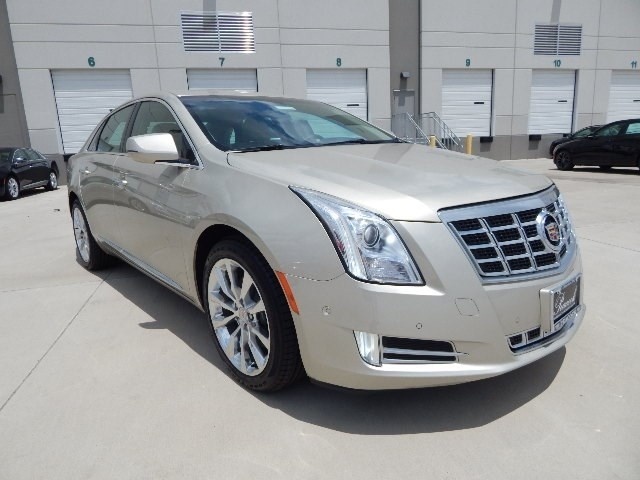 Have you driven a 2014 Cadillac XTS? My 2014 cadillac xts, push button start, wont start and the service theft deterrent message keep coming on... whats wrong? where are adjuster located if there are any.